RBI has come up with new idea, as per which, you will get to keep your account number when you switch banks. This is just the way Mobile Number Portability works. You can change the bank, but you don’t have to get a new account number. We remember our account numbers with such difficulty. Getting a new one can be a hassle. This is a fresh change and a great relief. How can the shift happen? The Banking accounts will become portable via Aadhar cards. According to RBI Chief S S Mundra, advancements in technology will make this possible. In fact, opening a bank account will become much easier. If you think about the past few years, then we have already got ourselves an Aadhar card which has replaced identity cards. Even Aadhar cards are now linked to bank accounts. This makes it easier for banks to verify the person who is opening the account. By keeping the account number same, banks can also rest in the fact that there is a unique number for each and every account holder and that number doesn’t change frequently. From the consumer’s point of view, they will have more options now. They can switch from one bank to the other without hassle. This will keep the banking companies on their toes and the competition would definitely benefit the consumers. Also, multiple bank accounts can be taken under one umbrella. But will this be possible? Right now this is in the idea stage only. There are many reasons why this could not be possible. For instance, there is the Know Your Customer (KYC) issue which could pose a hurdle in determining the shift. This is because the diligence devoted to check the KYC norms vary from bank to bank. Some banks may not accept an account from another bank because they do not trust that KYC was done properly. Hence, many banks may pose a threat towards this shift. Also, experts believe that there is a chance that the frauds change their bank accounts very often to forego the Money Laundering Act. Hence, proper steps have to be taken before such a change is made. This is why banks must have a proper KYC checking procedure to prevent Money Laundering. Also, banks will have to restructure their accounting systems to ensure that all the account numbers are available at a treasury of data. This facility is already present in many regions of the world like Europe. However, it is handled differently in different parts of the world. The mechanism to handle subsequent bank switching is not yet put in place. We already know the Aadhar Linked Payments system is put in place. 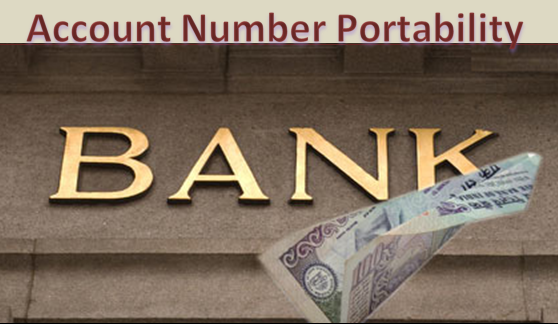 With the help of this system, India can float the account number portability system. Also, if they are able to achieve this, then India will be first country in the world to come up with such a unique system. Right now it only remains to be seen how soon it can happen.